Perry Hoffman’s culinary focus at SHED is built around the mission to showcase the links between responsible farming, ingredient-driven cooking, and flavorful food. In crafting his dishes and the SHED Pantry line of powders, salts, pickles and preserved fruits, he’s inspired by what is coming in from the fields and foraged nearby. Hoffman’s mantra is, “The garden tells me what to cook.” Hoffman collaborates with the farmer at SHED’s own HomeFarm to grow unusual herbs and flowers, in addition to the heirloom fruit trees and vegetables. A Napa Valley native, Perry Hoffman literally grew up in fine dining wine country kitchens with his grandparents, Sally and Don Schmitt, who were the original owners of The French Laundry in Yountville. He first became interested in cooking by helping his grandmother in the kitchen, assisting her with tasks such as making croutons, roasting bell peppers and chopping parsley. After his early culinary training around Napa Valley and Anderson Valley, he was courted by Chef Robert Curry at Auberge du Soleil in Rutherford in 2005. 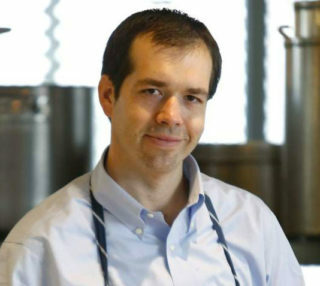 During his two years at Auberge, Hoffman helped the restaurant achieve its first Michelin star rating. Hoffman had a celebrated eight-year run as the Chef of étoile Restaurant at Domaine Chandon (closed in 2015) in Yountville, CA. During his time there Hoffman developed the culinary garden to bring estate grown heirloom produce and herbs to the plate. In his tenure, étoile had a Michelin one-star rating for three years. Hoffman lives with his wife in Healdsburg, Calif. Combining his passion for food with his love of the outdoors, when he is away from the kitchen he enjoys fishing, farming, cheese and wine.